Radical Iraqi cleric Moqtada al-Sadr personally intervened to free a British journalist kidnapped by gunmen in the southern city of Basra. They had threatened to execute James Brandon, an Arabic-speaking freelance writer, within 24 hours if US forces did not pull out of Najaf. 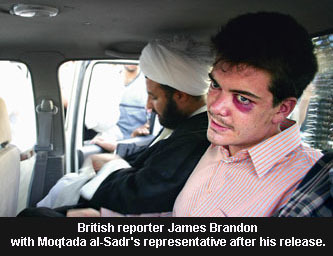 But Brandon's 20-hour ordeal ended when he was handed over to the cleric's lieutenants in Basra. Brandon appeared with a black eye and bruised face at a hastily organised press conference at the offices of al-Sadr's organisation. Brandon said he had been treated harshly during his seizure at a hotel in central Basra. "I'm OK - I'm recovering. I've been released thanks to the Mahdi Army, because they intervened and negotiated with the kidnappers. All sorts of unpleasant things happened. I want to say thanks to the people who captured me. Once they knew I was a journalist I was treated very well." Buoyed by mass demonstrations condemning a US offensive aimed at crushing his nine-day old uprising, al-Sadr was defiant towards what he called the "dictatorial" interim Government trying to negotiate an end to the standoff. "I advise the dictatorial, agent Government to resign . . . the whole Iraqi people demands the resignation of the Government," he told fighters holed up in the city's Imam Ali shrine. "I will not leave this holy city," he told his fighters, who chanted "no, no to America" in response. "We will remain here defending the holy shrines until victory or martyrdom." A spokesman had earlier said the cleric would pull his forces out of Najaf if US forces also withdrew and religious authorities agreed to administer the city's sacred sites, the holiest for Iraq's majority Shiite Muslims. But the fiery speech, designed to rally militia fighters who have suffered heavy losses against US warplanes and tanks, appeared to reject earlier government overtures for a deal to end the confrontation. Al-Sadr's hand and arm were bandaged, apparently confirming a report by his spokesman that he had been wounded in the chest, arm and leg in fighting around Najaf's cemetery on Friday. He appeared otherwise fit. Interior Minister Falah al-Naqib of Iraq's interim Government earlier denied al-Sadr had been wounded and said a truce had been in force since Thursday night. "Sayyed Moqtada will not be touched if he leaves the shrine peacefully," Mr Naqib said. The uprising in Najaf has killed hundreds and threatened to undermine the rule of interim Prime Minister Iyad Allawi, who is walking a tightrope trying to crush the radical Shiite rebellion across southern Iraq that has hit oil exports. By evening, witnesses said US soldiers had withdrawn from positions near al-Sadr's house in Najaf, which they raided on Thursday during their offensive on fighters around the Imam Ali mosque and the city's cemetery, strongholds for al-Sadr's men. US planes bombed targets in the city of Fallujah for the second day, killing six Iraqis, including two children, hospital officials said.